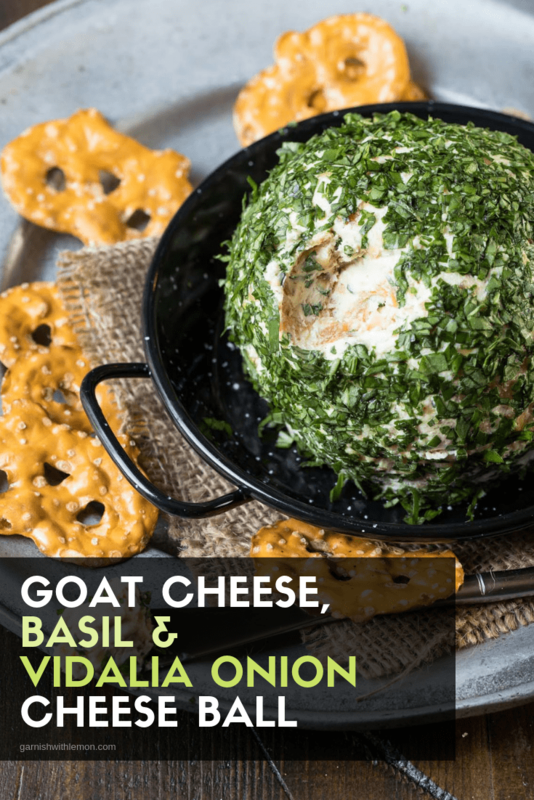 Sweet Vidalia Onions balance tangy goat cheese and fragrant basil to create an irresistible flavor combination in this Goat Cheese, Basil and Vidalia Onion Cheese Ball. Why? The secret to the irresistible flavor of this cheese ball is Vidalia onions, and they are only available for a limited time every year. Vidalias are grown exclusively in Georgia where the combination of soil, water, and climate contribute to their unique sweetness. Some people claim they are so sweet you can eat them out of hand (I have never tried this), but I can vouch for their rich flavor in this Goat Cheese, Basil and Vidalia Onion Cheese Ball Recipe. 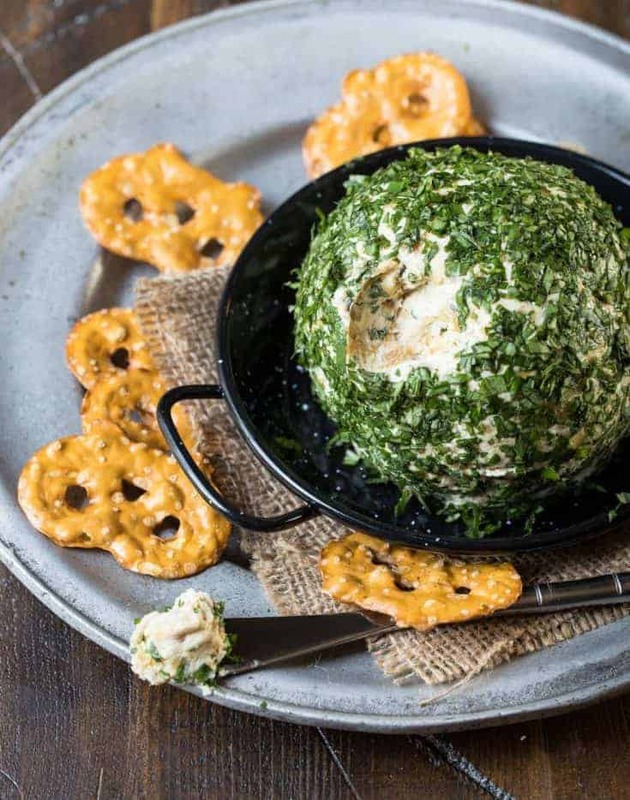 We love to scoop up this yummy cheese ball with salty, crunchy pretzel crisps, but feel free to swap in your favorite cracker. It’s equally tasty on toasted crostini, fresh baguette slices or even with carrot and celery sticks. Tip: Caramelizing the onions takes about an hour from start to finish so plan accordingly. Don’t rush this step, or you’ll miss out on the full flavor of the onions. Feel free to make the onions a day or two earlier and pop in the fridge until ready to assemble the cheese ball. Disclosure: This post is sponsored by the Vidalia Onion Committee. All opinions are my own. Thanks for supporting the organizations that make Garnish with Lemon possible. Place oil and butter in a 12-inch skillet and heat over medium-low heat. Place onions in skillet and stir to coat. Cook for 20 minutes, stirring occasionally. Add salt, stir, and cook for another 40 minutes or until golden brown, stirring occasionally. Allow to cool and coarsely chop. Set aside or refrigerate until ready to use. Place goat cheese and cream cheese in a small bowl and mix until thoroughly incorporated. Stir in 2 1/2 tablespoons of basil and caramelized onions. Season to taste with salt and pepper. Refrigerate for at least 30 minutes. Remove cheese mixture from refrigerator and scoop onto a piece of plastic wrap. Mold into a sphere and cover tightly with plastic wrap. Refrigerate for at least 4 hours. 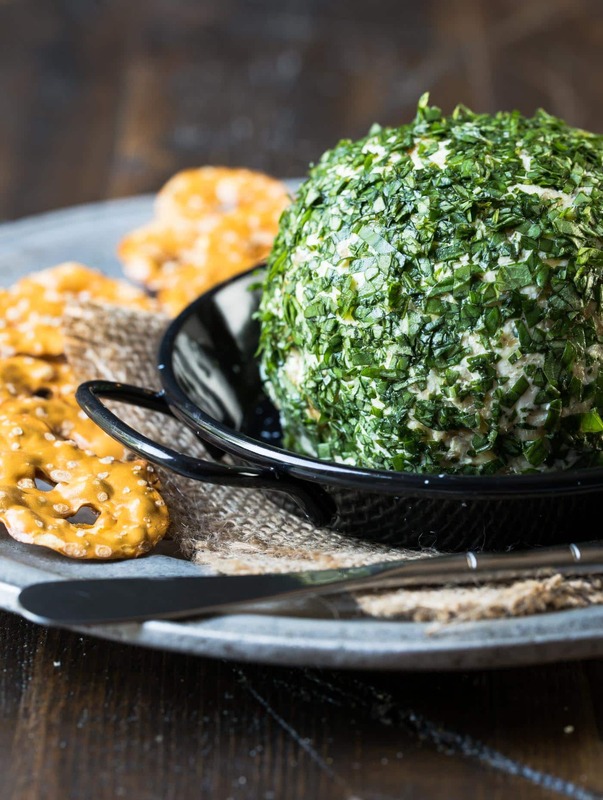 Remove plastic wrap from cheese ball and roll ball in remaining 1/3 cup minced basil. Serve immediately.